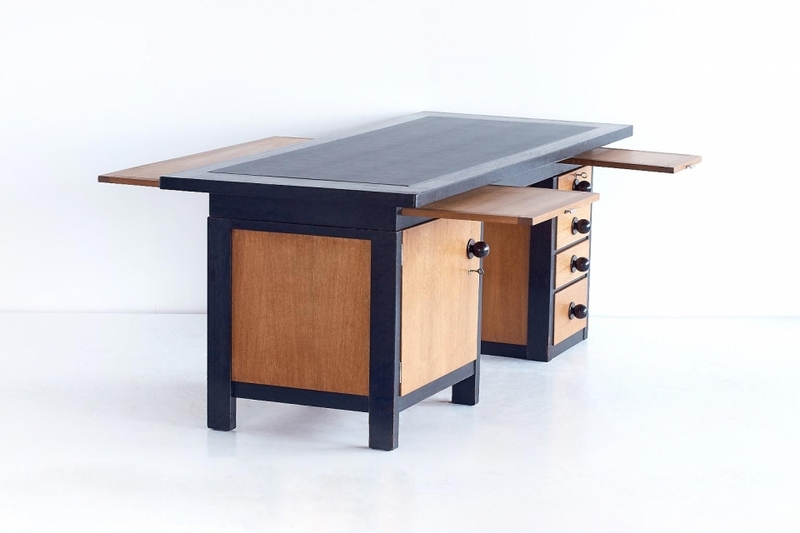 This monumental desk was designed by Frits Spanjaard in 1932. 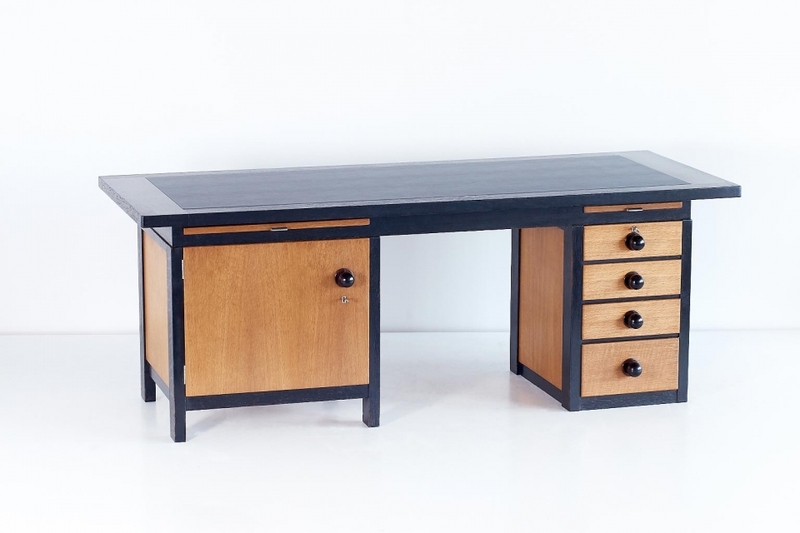 Due to its generous proportions, striking assymetry, contrasting woods and the large knobs in Macassar ebony, the desk can be considered as an important example of the Haagse School (The Hague School) style. The desk has four large drawers on the right, which can be simultaneously locked with a single key. The interior on the left features six drawers and additional storage, and can be locked altogether as well. Particularly noteworthy are the four cleverly incorporated pull-out shelves of different dimensions creating additional space: two on the front, one on the right side and one large shelf on the back side. 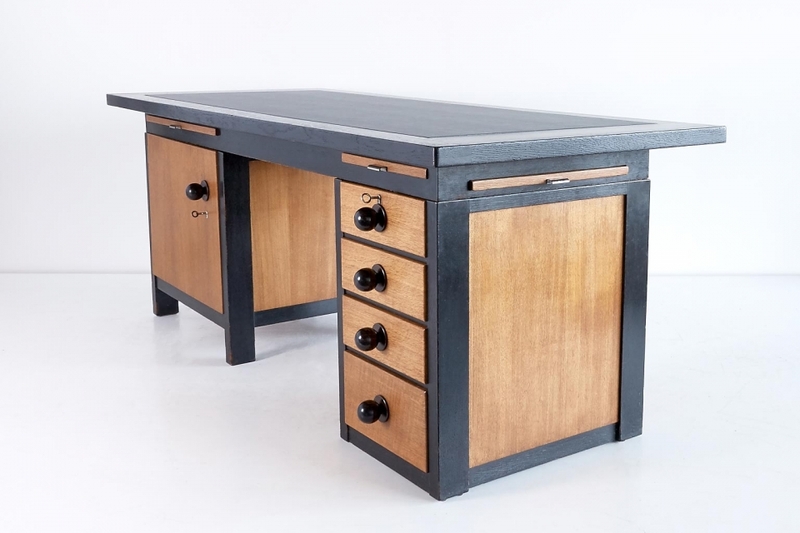 The desktop is executed in dark stained oak and features a dark grey leather insert. in 1932, the prosperous Van Stolk & Reese company commissioned Spanjaard to design the interior and furniture of their offices located on the Ceintuurbaan in Rotterdam. 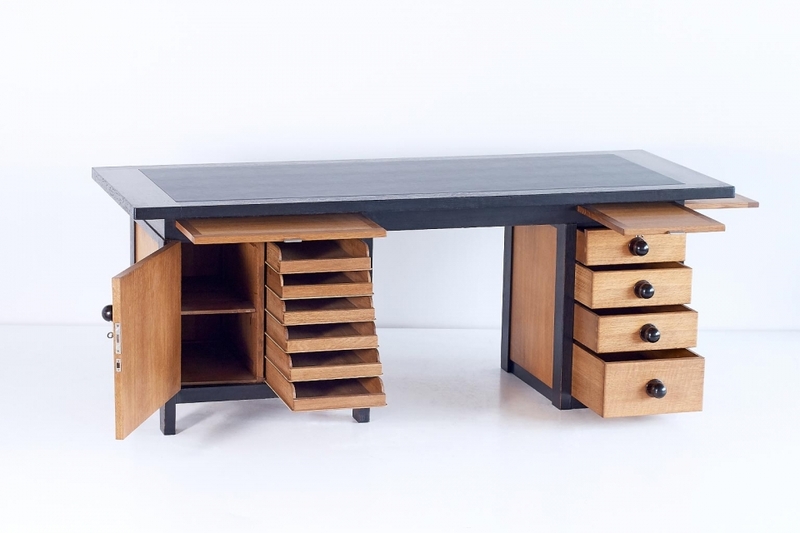 This custom desk was most likely designed for the office of the company’s director, which was designed by Spanjaard in a radically modernist way, combining his own sumptuous designs with the functionalist tubular steel furniture made by W.H. Gispen. Between 1925 and 1935 the work of Spanjaard was strongly connected to the Haagse School movement of which he’d become a main proponent. This style was not so much inspired by the Classic European Art Deco capitals such as Paris and Vienna but more by other national and international architectural developments such as the work of Frank Lloyd Wright. The influential magazine Wendingen published a series of articles on Wright still relatively unknown at the time in 1925 and the renowned architect Jan Wils also played an important role in the orientation towards Wrights work in The Netherlands. In its particular application of geometric shapes, primary colours and its sophisticated cubist division of the surface, the Haagse School designers were also aware of De Stijl movement, lead by contemporaries such as Gerrit Rietveld and Piet Mondriaan. At the same time the geometry, the harmonious proportions and the understated decorations were primarily based on the rationalist design principles of H.P. Berlage, who would later become one of Spanjaard’s clients himself. Design had to meet the functional demands of the user but purely utilitarian ideas were certainly not the most important. Due to his frequent travels to Germany, Spanjaard was also familiar with the designs of Marcel Breuer and Mies van der Rohe, especially appreciating the simplicity and purity of their designs. Biography: Frits Spanjaard (1889-1978) started his career as the artistic director of the LOV furniture firm in Oosterbeek. He left the company in 1923 and moved to The Hague, where he started his own interior design studio with Cor Alons. From the very beginning he received numerous commissions for private residences and offices, not only re-designing entire interiors including wall panelling, furniture and even the smallest accessories but also determining the exact placement of every object. The high point of his career was between 1925 and 1935. After WWII –during which he went into hiding- Spanjaard did not want to give in to the emerging series production of furniture. Even though he received far fewer private commissions, he still worked on some major projects such as the town halls of Utrecht and Eindhoven. References: De Haagse Stijl: Art Deco in Nederland. Timo De Rijk. Uitgeverij 010, Rotterdam, 2004. Page 81-103 (page 89 for a similar desk); Frits Spanjaard Archives, RKD Netherlands Institute for Art History, The Hague. Accession number NL-HaRKD.0104; Frits Spanjaard: Binnenhuisarchitect 1889-1978. Marg van der Burg. Uitgeverij 010, Rotterdam, 1990.